Everyone advises us to think futuristic (say five years), be clear what you want, aim for specific things, etc. Well, these things look pretty theoretically, but none of us find it easy and smooth like it seemed while jotting them on the paper. It is because the human mind is insecure & precarious. Yes, it’s important to think about the future & your goals. But just dreaming, procrastinating & getting stressed, isn’t a good idea. We have to achieve them with some smart strategy. 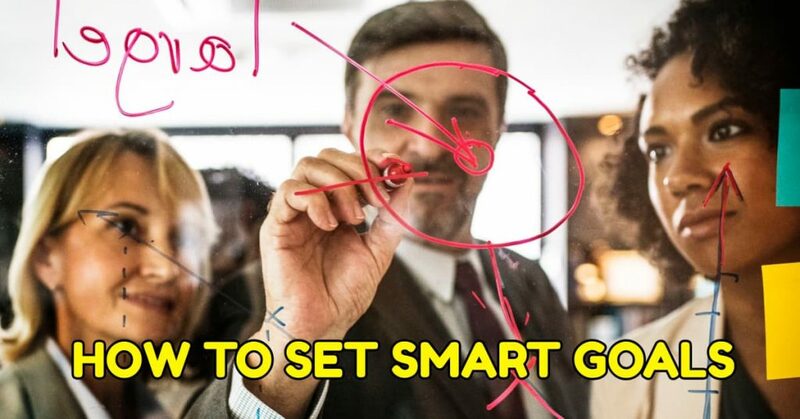 Here’s a powerful approach to “How to set smart goals for 2019”. Our discussion is primarily on two aspects/parts. Firstly, the building blocks of SMART goals. Secondly, factors that drag you down. Each & everything is relatable, so stick to the article. Goals are ambitious objective or aim of a person: things you want to achieve, that prestigious milestone. Setting SMART Goals isn’t hard. So first take a corner & calm down. Setting goals aren’t enough for success. But setting meaningful goals is worthy. SMART Goals are something you will be proud if achieved. Goals which make you consistent, excited & give you faith. You just can’t set a goal & think it will get accomplished because a goal without action is always a wish. What all things motivate you? Before moving onto the 5 Blocks of SMART, we must think, what motivates you. While setting goals, you need to look for things which matter you a lot. Motivation is necessary because it shows priority. If the outcome matters to you as your priority, you are more likely to feel motivated. Setting up goals according to priority is the best method. Prioritize your goals & plan them. Complete your goals & say proudly, “I plan, I accomplish!”. Writing your goals enhances your success rate. You might have thought about your goal but keeping it in might not help you. Write your goals so that you can easily rank them. Before prioritizing, It ensures that you don’t miss out on any of the goals. Written goals keep on reminding you about your goals. Meanwhile, if you keep it in your mind, you are most likely forget it because of mood changes. Writing also helps in keeping track. Harvard University between 1953 and 1973 conducted a study on particular students of a class. They advised every student to keep writing their goals. In 1973 only 3% of those students followed the advice. Comparing the success of 3% student vs. the 97%, just the 3% student who followed the instruction was worth more than 97% others. So writing down your goals does positively affect your life. Your goals should be simple, definite & precise. Make your goal as simple it can be. Setting up goals which are complex, unclear or indefinite might give you a failure. So specify your goal, stick to it & be motivated. Changing your goals before completing the previous one might end you up with disappointment. So try to accomplish one goal at a time. For example, Suppose Alex admires Mike & decides to attain that physique. He is highly motivated, starts the workout, etc. After a few days/weeks, he watches David, Alex liked David this time. His goals change from Mike to David. What if his admiration changes again? So an uncertain or volatile goal won’t succeed at any cost. Be specific with your goal & you will achieve it. Measuring or keeping track of your progress is an effective way. Doing this, you might never miss the little happiness of accomplishment. This step has two advantages. First, it helps to keep a track. Secondly, sometimes things don’t work according to us, keeping track/measures can help you figure out what’s going wrong. Example: Alex has decided to write a novel of 18000 words in 1 month. That means he has to write 600 words per day. If he misses any day, he will write 1200 words the next day. So measuring fragments the work. Thinking of 18000 words seems a difficult task. But fragmenting it, 600 words per day seems fine. Your goals should be realistic, i.e. achievable. Keeping goals high is excellent but expecting the impossible is stupidity. Never set goals which won’t get complete. Setting unrealistic goals is like committing, “I can beat a Black Hole.” By unrealistic goals we mean, things which aren’t possible(at least humanly). You should have confidence & faith in you! Because in the end, that’s what matters! Example: Alex is a 26-year-old boy, he loves to play football. He has been working in a company but wants to be a Professional Footballer. Alex wants to become Pro like Ronaldo/Messi. He is an average player, but he is thinking to give up job & go for football. Do you think he will succeed? Definitely NOT! He has been told, to become a pro, there’s a principle, “10000 hours of practice time!”. Alex is 26 & even if he trains 5 hours a day, he will require six more years. Till the time he will prepare, most of the footballer’s retire. His age would go & 32-year-old player won’t be able to compete against young players (Clubs won’t sign him). So this goal is unrealistic. Goals need to be achievable & to be achievable; they need to be realistic. Your goals need to be relevant to your life, lifestyle & career. Goals which are aligned appropriately with your life are more likely to accomplish. Action for goals requires time & time needs to be preplanned. You have got a goal; you will need time management. So setting up things which aren’t relevant to your life will ultimately waste your time. Example: Alex is a 16-year-old boy, he is average at academics, good at sports, etc. His goal is to build muscles this year. Do you wonder what’s irrelevant? Keep on reading! Alex has got a busy schedule, 7 am to 2/3 pm Junior College, 4 pm to 7 pm Coaching classes, 7 pm to 8 pm traveling back to home, 8 pm to 9:30 pm he goes to the gym, 10- 11 pm completing homework & 11 pm to 12/1 am self-study. Alex’s schedule is damn hectic; he isn’t able to give his body rest. What would happen? Alex takes a sleep of just 5-6 hours & sometimes even less. As a result, his body might not gain muscle. The result is failing in his goal. To manage this situation, he can go for the gym early morning, cut out time from self-study or reduce gym time. Arranging time might make his goal-relevant. Your goals should always have a deadline. Or a specific period within which you will achieve the goal. Stay committed with a mindset of success. Presence of deadline increases your work time & decreases goal accomplishment time. Example: A group of 10 employees is given 150 pages to type. There’s no deadline. Employees won’t complete the work because of mindset saying “Will do it tomorrow.” And, tomorrow never comes. Meanwhile, if they are given a deadline of 2 days, they will complete the work. So a time-based/sensitive deadline is necessary. Feeling jealous & taking wrong steps. Goals are necessary for every individual’s life. We do have goals but accomplishing it depends on us. Setting SMART Goals reduce the chances of failure & disappointment. So grab a paper & pen. Put down your goals eliminating factors that drag you down. Prioritize your goals & rank them. Apply the SMART GOAL (Specific – Measurable – Achievable – Relevant – Time Sensitive). Set your goals keeping in mind -What do you want to become and what type of person you see yourself after the year. What all things you are going to achieve this year? Work hard towards it so that you can accomplish another list of goals next year!